(NationalSecurity.news) It has cost taxpayers nearly $13 billion, making it the most expensive warship in history, but the Pentagon’s weapons-tester says in a new memo the ship may not yet be ready to fight. As reported by Bloomberg News, the USS Gerald R. Ford could struggle in its principle task – launching and recovering aircraft – while it may also be unable to mount a defense and move munitions adequately. According to a June 28 memo obtained by Bloomberg News, on-board systems for those tasks have either poor or unknown reliability issues. “These four systems affect major areas of flight operations,” Michael Gilmore, the Defense Department’s director of operational test and evaluation, wrote Pentagon and Navy weapons buyers Frank Kendall and Sean Stackley. 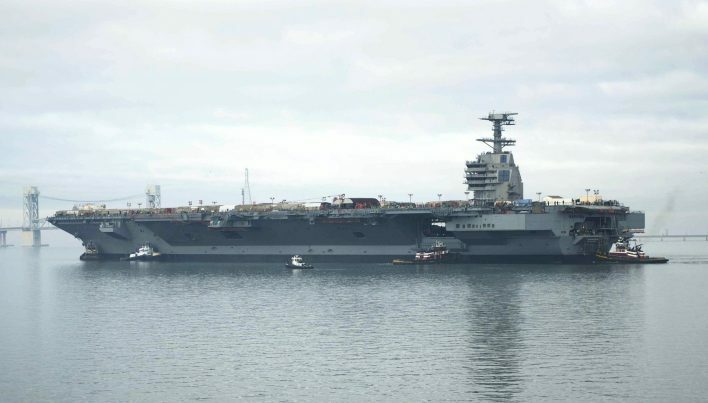 “Unless these issues are resolved, which would likely require redesigning” of aircraft launch and recovery systems, “they will significantly limit the CVN-78’s ability to conduct combat operations,” Gilmore said, employing a technical name for the carrier. Those reliability issues mean that Ford’s delivery – the first of three carriers ordered in a $42 billion acquisition program – will likely fall further behind schedule. Like the Air Force’s problem-plagued F-35, that service’s most expensive fighter plane program in history, Ford’s delay puts American power projection at risk in a world growing increasingly unstable by the year. The Ford was to originally report for duty in September 2014, but now likely won’t be delivered before November of this year due to the unspecified testing issues. The Navy has had 10 carriers in operation since the retirement of the USS Enterprise in 2012 – a situation that has led to extended deployments for the remaining carrier fleet, putting additional stress on ships and crews as they strain to meet global commitments from battling ISIS to ensuring freedom of navigation in the South China Sea. A delay in Ford’s delivery could also mean U.S. forces will be hampered if a new conflict were to arise. The Ford is being manufactured by Huntington Ingalls Industries, Inc. As delivery of the draws closer, Gilmore wrote that his “concerns about the reliability of these systems remain and the risk to the ship’s ability to succeed in combat grows as these reliability issues remain unresolved. Huntington Ingalls says the Ford is 98 percent complete. The Navy said the company has turned over 97 percent of the carrier’s compartments and 89 percent of shipboard testing is completed. The Navy plans to deploy the Ford for full combat operations by 2021 after conducting sea trials that should begin in fiscal year 2018.